Detail from ESSAM, Drone Campaign Poster (2012). If the epoch of a technology is signaled by the simultaneous appearance of new potential uses and looming ethical questions, then without a doubt we've entered the age of the drone. In mid-October, individuals from the drone industry, aviation policymakers, lawyers, engineers, makers, activists, and artists gathered at the first Drone and Aerial Robotics Conference (DARC) in New York City to draw together the swarm of questions and possibilities that this technology engenders. Defining "drone" is no small part of the problem. Those who work in the industry shy away from the "d-word for many reasons, not least of which is the image of the "drone strike." The US government is using the more innocuous acronyms of UAV (unmanned/unpiloted aerial vehicle) or RPA (remotely piloted aircraft) to simply evoke the technology's long-accepted use as surveillance tools—with which to guide other weapon strikes. But an acronym makes for crappy branding, and it seems the word drone is here to stay. And yet, we're not any closer to defining what a drone is. A drone is a quadcopter that fits in the palm of your hand. It's a massive flying wing, rigged with solar panels so that it can orbit the atmosphere continuously. It is the Mars rover Curiosity, it is a Roomba, it is a driverless car. It is the mapping software running on your flying machine, or it is the smart phone that is used to control it. A drone is all of these, and a drone is the collection of social issues that accompany these technologies, as autonomous algorithms, ubiquitous surveillance, and flying weapons make their way into our cities and skies, changing our way of life for good. For example, Michael Toscano, the head of the Association for Unmanned Vehicle Systems International (UAVSI), what some might call the "drone lobby," views drone problems as a marketing issue. "Predators are what people think of when they hear the word drone," he said during his talk. In his view, safety and privacy are the two biggest issues facing the industry—but from the perspective of perception. His solution is to focus on shifting the discourse around drones so that the public stops thinking of Predators and instead visualizes the safety and security of machinery. He didn't mention how drones would actually be used to further privacy and safety, other than the often-repeated caricature of drones as a "humanitarian and policing tool," with no case studies to back up that assertion. On the other hand, you have Code Pink and other allied anti-war protesters, who turned out to heckle Toscano and to educate conference attendees about the drone strikes in Pakistan, Afghanistan, Yemen, Somalia, and other countries, those acknowledged by the US military and those not. Drones, to them, are just another "symptom" of the military-industrial complex, and in this way, a potent symbol for their anti-war protest campaigns. However, their passion was not shared by the engineers at the conference, who simply view their drone-related projects as part of the much wider commercial aerospace industry. 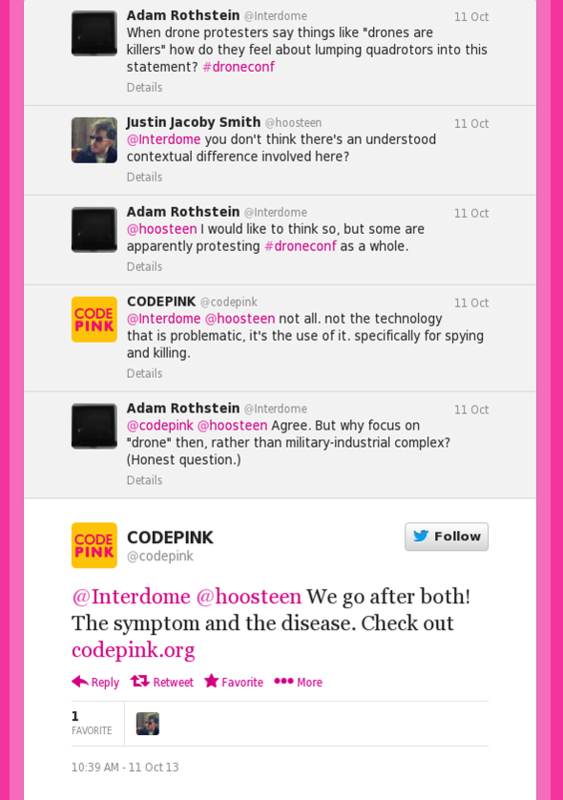 Screenshot of Twitter exchange between the author and Code Pink. The engineers who attended the conference think of drones in the contemporary terms of software, hardware, platforms, and users. Buddy Manchini, director of research and development for UAV platform developer Airware, spoke in his talk about making drone software as compatible cross-platform as cell phone apps. Until there was some operating system unity, he argued, drone applications would not be able to spread as widely as they could, just as it was with desktop computers and cell phones. Lawyers in attendance viewed drones in terms of a much older operating system—jurisprudence. Brendan Schulman, who represents a number of commercial drone clients, thought that it was the use of military drones that caused the FAA to begin crafting rules for the previously unregulated use of remote control vehicles. John Kaag, a professor of philosophy from UMass Lowell, was more concerned about the legal terrain from the perspective of the public, and how the introduction of drones into public space shrinks the expectation of privacy even more than technology already has. And then there are the artists. Drones have certainly been buzzing in art, as seen in the varied cultural output of figures such as Trevor Paglen, Honor Harger, James Bridle, and Natalie Jerimijenko. 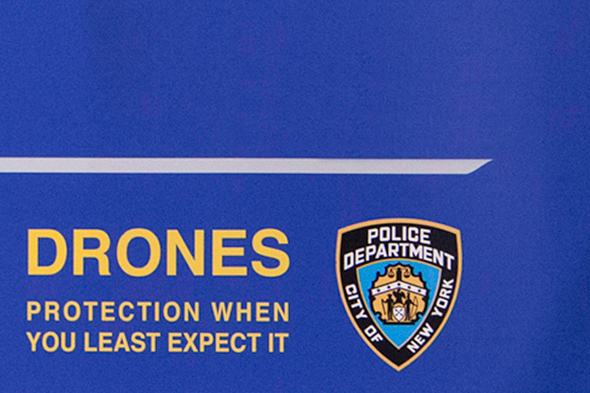 Jerimijenko and Bridle spoke on a panel at DARC, along with the writer behind Twitter account @drunkpredatordrone and the artist ESSAM, who had recently been arrested by officers from the counter-terrorism task force for his parody NYPD drone posters. One of the primary goals of drone-related art, these speakers concluded, is to raise awareness about drone-related issues. And they certainly have done that—ESSAM's recent arrest being only the most sensational evidence. But what is the next step after awareness? The panel was not so sure. DARC certainly proved that there is a burgeoning awareness of drones, as drones themselves develop out from their military origins. There are many trajectories here. While the different voices at DARC could easily outline the next steps for their own projects, no one had a conclusive idea on how these should all be linked together into one concept of "drones," and what it ought to be. The commercial drone industry has the power of money behind it. The makers and engineers have their knowledge of the cutting edge technology. And artists, activists, and lawyers are investigating the ethical issues raised by drones, each in their own way. But between the politics, the money, the tech, and the ethics, drones are still elusive, not willing to be contained by any one of these systems. Nor should we expect them to be. No new technology is going to be simple. Technology interacts with society by cutting across it, by veering off at odd angles when it strikes a particularly jagged facet. But we are responsible for these ricochets. Tech investment and development is not agnostic—those who make things are always ethically responsible for their potential, both good and bad. Artists and activists are driven by ethical aims—but they must navigate the complicated systems of technology, and not simplify things for their benefit. There are people out there in the world, flying drones and being overflown by drones, making drones and being killed by drones. A proper definition of drones is not going to end this, regardless of which interest ends up defining the public's understanding of this nascent technology. A drone is a technology—in its most basic sense, a tool. A tool is going to be used, its usage will change over time, and the ideas we have of that tool will come from how it is used. Likewise, a tool's use will shape us, as a society and as individuals. We have to think about how we are going to use drones to better understand drones, and ourselves. Perhaps the uses that will best reveal this are out there already, among the various camps in attendance at DARC. But perhaps they still wait to be invented.